Happy OCD Awareness Week! 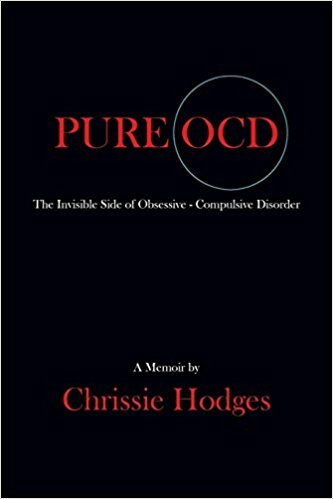 As you may know, I’m the president of OCD Twin Cities, the local affiliate of the International OCD Foundation (IOCDF), and I’m excited to host Chrissie Hodges this Thursday! If you’re in the area, I hope you’ll join us from 7 to 9 at the Wilder Center, Auditorium A, 451 Lexington Parkway North, St. Paul, MN 55104. Chrissie is an incredible advocate for OCD awareness. 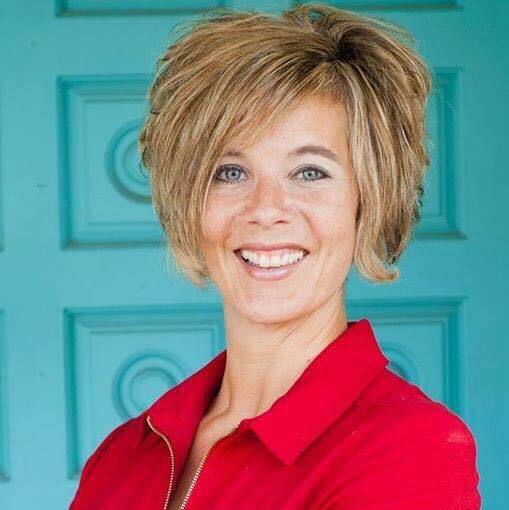 She often speaks at conferences, to law enforcement, and to lawmakers, appears in live videos for Mental Health on The Mighty, and hosts a YouTube channel, Chrissie Hodges/Pure OCD Advocate. You received the 2017 International OCD Foundation Hero Award. How did that make you feel? It was a great honor to receive the hero award, especially following in the footsteps of a couple of my favorite advocates! I think it made me feel more encouraged, not only in my own advocacy, but in encouraging others to pursue their own and find ways of telling and expressing their lived experience. It was a weird feeling, kind of like the impostor syndrome. I don’t feel like my story of survival and recovery or even my ability to talk about it so openly is heroic…I feel like the people I connect with every day in my work who are actively working toward the courage to get better and face this beast of an illness are my true heroes, and they are the reason I find the courage every day to keep speaking out. Anyone who lives with OCD and survives each day with it is a hero in their own right! 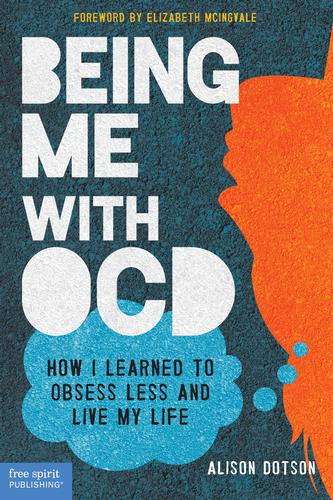 Your memoir, Pure OCD: The Invisible Side of Obsessive-Compulsive Disorder, came out this past year. Why did you write it? What do you hope people will get from it? I originally wrote is as a tool for myself to read during relapses to remind myself that I really do have OCD. I struggle terribly with the “what if I don’t really have OCD and my obsessions are real” fear, so I thought if I could read about my history with it, it could be a good reminder and motivator in remembering that therapy works and things will get better. When I decided to publish it as a memoir, I hoped that people could use what I had been through to normalize their experience and feel less alone. People love your live videos! How do you choose the topics? Has there been one video or subject that’s been particularly difficult to talk about? Thank you! 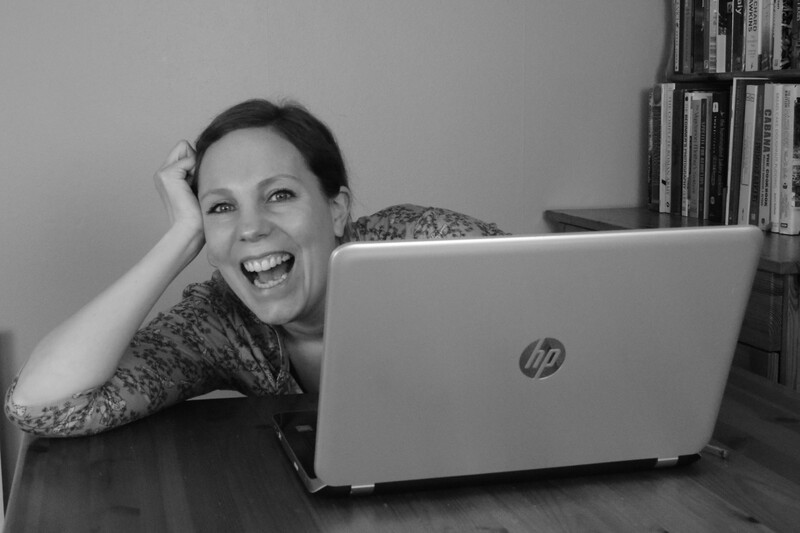 I usually choose topics based on what I have and what my clients are suffering with. The journey to recovery is so complex with OCD, it really isn’t just about therapy then recovery. It’s so emotionally difficult, so I try to do videos based on what I see as common obstacles for my clients. At first the difficult videos were the topics that are so taboo and the lesser known physical symptoms like groin movement and urges. But after being so open over and over and getting so much positive feedback, it has been so much easier to just be absolutely transparent without reservation. You’ve shed a lot of light on sexual intrusive thoughts and helped people feel less ashamed of them. Tell us why you’re known as “Groinal Girl” among the OCD community. Haha! It was at the IOCDF conference in Chicago sitting on a panel with you when I decided to open up publicly about how one of my most tormenting symptoms is when I get “the groinal syndrome,” which is a compulsion of checking and rechecking the groin area for movement or “arousal” when exposed to a sexual intrusive thought. I was so nervous, but the reaction was overwhelming and helped individuals who experience it feel less alone. I did a video on it shortly after and it is highly successful and has been watched more than almost any of my other videos! I think I self-proclaimed the #groinalgirl title! “Groinal Girl” isn’t the only title you have. You’re a certified peer specialist. Tell us what that means. I fell into peer support shortly after I began my advocacy career. I was helping people with their journey through OCD and realized that I needed formal training to learn to support people and not contribute to their symptoms! I went through intense training here in Colorado and worked full-time with individuals in the community as well as on the teams at the Colorado State Institution at Fort Logan with individuals with major mental illness and substance use disorders. I loved it. Simultaneously, I was working alongside Matt Myles, OCD specialist here in Denver, as an ERP coach and peer support under his supervision. I saw the need for peer support in OCD treatment and recovery and in 2016 I launched my business doing peer support and consultations for OCD therapist referrals and resources worldwide. Through peer support, I meet with individuals to help support and normalize their experience by using my own lived experience. It has been wildly successful and I work with individuals with sessions one-time, ongoing, or as needed in any stage of treatment before or after. I also work with OCD therapists to coach individuals through exposures by enforcing their hierarchy plan. Both are incredibly beneficial in instilling hope and support to the client as they work toward recovery. What can attendees of the OCD Twin Cities OCD Awareness Week event expect? I’m hoping to share my lived experience and story of not only my medical recovery, but my emotional recovery, which was equally as tough to work through. I’m hoping people will walk away feeling a sense of belonging to a community where we don’t have to feel shame, guilt, or embarrassment on what we’ve been through. Happy Tuesday! Please welcome Catherine Benfield, OCD warrior and creator of Olivia, a rather adorable cartoon representation of Catherine’s obsessions. Olivia has been making the rounds on social media and regular media, so she may look familiar — but even if she doesn’t, you’re about to learn all about her, and you may even feel inspired to dream up your own “OCD as an annoying but not exactly terrifying” character. I just love Catherine’s outlook on OCD and appreciate her candor, so I’ll let her take over now! How long have you had OCD, and how did you first realize what you were experiencing might be OCD? I’ve had OCD for as long as I can remember. As a child, I was terrified of harm coming to my loved ones and compulsions took up a lot of my time. I checked taps, switches, plug sockets, window latches, basically everything and anything. I also had to repeat things until they felt just right and at times it was very difficult for me to lead a normal life. I saw a few things on the media about OCD during my late teens so realized that that was probably what I had, but in true anxiety style I was too ashamed and frightened to tell anyone. This theme of OCD — of checking everything — stayed with me to varying degrees until my early 30s, with whole years of being much, much better in between where I managed to hold down a successful teaching career, get married, and begin the extension of my family. In 2012, I had my son, and about five days after that, my checking OCD returned in force. This was shortly followed by what I now know is postnatal OCD and I became very poorly. I didn’t know what it was at the time, and what ensued was, without doubt, the hardest and most frightening time in my history of living with OCD. I became convinced that I was going to harm my son or worse. My story gets a little heavy here but I want to be totally honest and get this out there so people know that they are not alone, and that it’s important to talk about it. 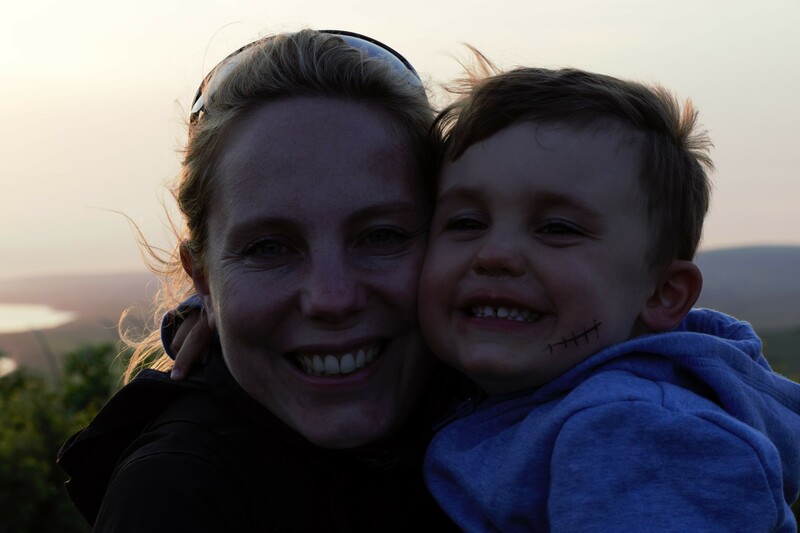 My postnatal OCD caused me to have graphic, detailed images of me hurting or killing my little boy every minute of every day. Obsessions, in general, can be based on thoughts, images, and urges and in this case, I experienced all three. The thing that terrified me the most was the urges. I now know that most new parents get have the odd urge to hurt their children, it’s just what the brain does, it’s all a bit random, but the difference with me was that whilst many people could brush them off as meaningless, my OCD kept replaying them because it wanted me to be certain that I wouldn’t do it. Ultimately, my OCD kept up until it had convinced me I was capable of harming my son. I hit crisis point and went to my doctor to beg him to take me away from my child for his own safety. That didn’t happen obviously and I received medication. I still had no idea that I had postnatal OCD. I went through a few months of misunderstandings and misdiagnoses before eventually I wondered if what I was experiencing could be related to the checking OCD I had. I keyed it into Google and found a world of stories just like mine and that’s where my recovery began. Accepting that I was the one who found out what was going on with me, and that I initially flew under the radar and didn’t get adequate help for a while, has been part of my recovery process. My medical team were amazing professionals, they just hadn’t been trained in all the ways OCD can present itself. Amazingly, only a few years later, I am seeing so many developments taking place in this field. It’s fantastic to see. Although not very nice, this time of my life was what got me actually looking for help and treatment; it helped me to accept that I needed to work hard to overcome the condition. Without hitting rock bottom, I’d still be wondering around checking everything all the time. So, the positives aren’t lost on me! Once you knew it was OCD, what steps did you take? Once I realized that I had postnatal OCD I went straight onto medication. I was desperate to stop the thoughts, images, and urges from circling like vultures and they bought me some much-needed relief. I hadn’t read much about how to recover from postnatal OCD because I was worried it would make it worse or give me creative suggestions for my next obsession — classic OCD talk! So, for a while the only way it got treated was with medication. It became clear that that wasn’t enough when I relapsed straight after coming off them, so I self-referred to CBT therapy. 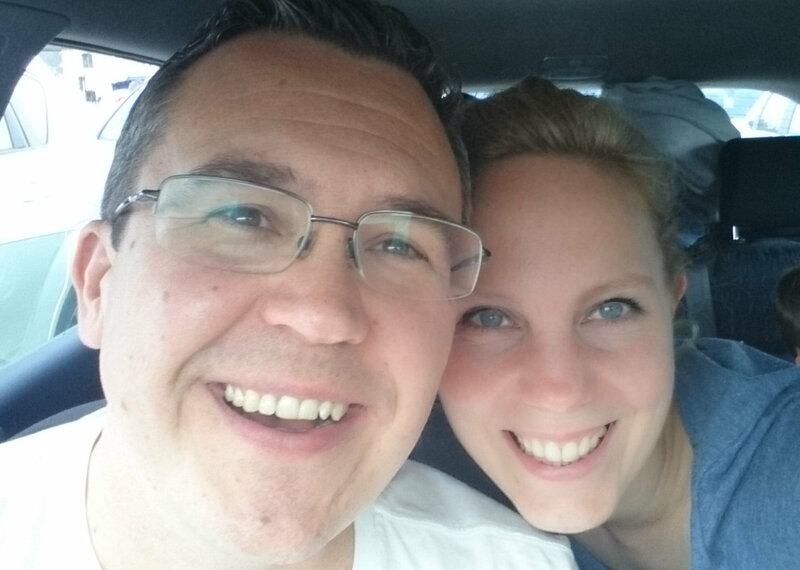 I spent twenty weeks with the most amazing therapist, and boy did she work me hard! We worked a lot on negative thinking styles, and thought challenging. I also live with generalized anxiety disorder and depression so we had to address some of those issues before I was ready to move onto the exposure and response prevention (ERP) work. I lost my parents shortly after finishing my first lot of therapy and relapsed, so I went back for another twenty sessions where we readdressed some issues and worked on bereavement. I came out of those sessions a new woman. I made sure I always completed my homework from therapy sessions too. I read everything I could about OCD, self-care, and mindfulness and I started implementing what I’d learned into my life. I did exposure work… I stood, holding my little boy in my arms, by the side of the road, on a bridge, at the top of an escalator, and on a train platform, whilst holding a carving knife, as a way of exposing myself to the fears that consumed me and I gradually started to see a shift in my thinking and sense of well-being. I told one non-medical person, my husband and absolute rock. I’ve always told him everything. He was worried, as anyone would be, but learned as much as he could about the condition and supported me the whole way through without falter. As for everyone else? I couldn’t bring myself to tell them. I couldn’t even imagine how that conversation would go. I thought once it “got out” everyone would be concerned about my child’s welfare and I wanted to stop them taking him away from me. Fear was still stopping me make helpful decisions. A couple of years later I decided to begin telling people. I felt like I was living a lie and wanted to be open about my OCD. I told my close family and friends, and once I knew I was going to start prepping for, and ultimately launching, Taming Olivia I told everyone. Not one person was anything other than totally supportive. I’ve had so many mind-blowingly open conversations about mental health since then — it really is incredible. Can you share some of your more common obsessions and compulsions with us? What techniques have you found most helpful in addressing them? A new one for me is the well-being of my son. As he’s got older, my OCD has shifted from physical harm to emotional, mental, and psychological harm. I often analyze how certain events may affect him. I trawl through memories or weigh up “evidence” trying to find out for certain that nothing has hurt him in this way. I find myself constantly wanting to ask, “And how did that make you feel?” I have to fight the urge to be too overprotective. Again, I use the strategies I mentioned above. More specifically I have to remind myself of “what I know.” I know there is nothing certain in life — I cannot be 100 percent sure that something hasn’t hurt him in this way. I know that OCD tends to focus on the things that are important to you and my son is definitely that. I challenge my thoughts. I stop myself from performing the compulsions; I don’t ask him all the time how he is feeling. I still struggle to find moderation here, so I look to my husband and friends as an example; it’s a bit like carrying out a survey. I use others to help give me an indication. I’ve found that treating my own OCD as “other” can be very helpful. You’ve taken that concept to a new level, creating “Olivia,” an impish cartoon character who represents your OCD. How did you come up with this idea? They say necessity is the mother of invention and that was very much the case for the development of Olivia. Due to the nature of my intrusive thoughts, my self-esteem had taken a nose-dive and I was looking for a strategy that I could use, alongside the strategies I was already using, to really hammer home the fact that the thoughts didn’t indicate something bad about me — that they weren’t “me.” I’d heard a few people say that their therapists had recommended giving their OCD a name; I tried this for a while but I personally found that it didn’t do enough to externalize the condition for me, so the next step was to extend that idea into a character. Most of my intrusive thoughts take place in image form, particularly the very unsettling ones, so it became the case of using images to help defuse images. It wasn’t really a conscious thing at first; I just started imagining Olivia throughout various daily OCD spikes and it really started to help. As I started seeing results, she became less abstract and developed a form and a personality. Olivia is now very much her own “being.” Every time a new OCD-related situation or theme comes along, I find I can adapt her to the situation, and it helps me appreciate the situation in a new light. I now use her to help me externalize all kinds of obsessions, not just image-based ones. 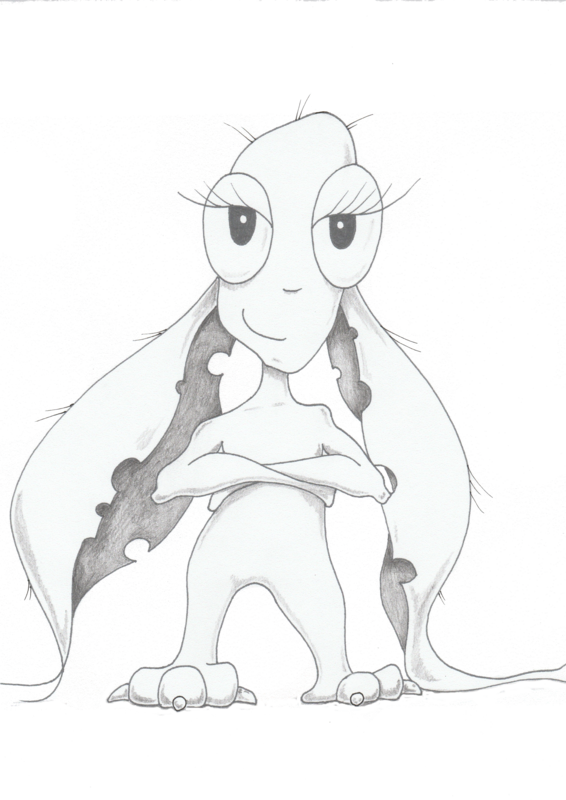 Physically, Olivia is a cross between an alien and a hare with a few extras thrown in. Her ears are important because they provide a very clear indication of when she is startled. I wanted her to be dramatic because it helped me see how over the top and irrational she — the OCD voice — could be. The arms and legs were vital too and they change depending on her mood. There’s a real vulnerability about hares, those big eyes and twitching noses. They’re not as cute as fluffy bunny rabbits but there’s something athletic and graceful about them. I always think it’s easy to see the raw panic they display, and that matched Olivia’s personality perfectly. (I also think it may stem back to when I watched Watership Down as a kid — if you’ve seen that film you’ll know what I’m talking about!) Finally, to round it all off, she’s a little tatty because she’s been through a lot. Actually, before I go on, I must take this opportunity to thank my husband as he is my honorary resident illustrator and responsible for getting Olivia “world-worthy.” He is a professional artist, which has proven very handy for me (not so much for him! 😊). I undertook some research to see if anyone else was doing the same thing to help them externalize their conditions and couldn’t find much information. What I did find was very heavily based on using fear to help externalize the condition. People were encouraged to imagine their OCD as a bully that constantly tried to manipulate them into certain thoughts and behaviors. Although I can see how that might work, it wasn’t something I was willing to do. There was enough about OCD that I found frightening already; the last thing I wanted to do was to live my life beside a character straight out of a horror film that required the energy to constantly battle it — so I reversed the idea. As a teacher and mother to a little boy, I found it more natural to imagine her as a child, and in this particular case, a frightened and vulnerable child. I do my best to try to understand that she is constantly focused on worst-case scenarios and that she kicks off big time if she wants my attention. I try very hard to show her empathy, kindness and compassion; it doesn’t always work, but on the whole, it does. I don’t want to struggle against her… I know from experience that that doesn’t work. The aim had always been to try to accept Olivia in my life. Funnily enough, since beginning this acceptance, I find I spend far less time with her than ever before. I spoke to a few other people about Olivia and got great feedback, so I decided to make it public in the hope it could help others. What kind of response have you gotten to Olivia? It seems that people love her! I’ve had some amazing feedback. I’ve received emails from all over the world telling me how much Olivia is helping people externalize their own conditions. They’re not all OCD related; I’ve heard from people with a range of mental health conditions saying that the concept is the only thing that’s worked for them. Some use Olivia; others create their own. I’ve had people share their own creations with me — it’s brilliant! Some of the characters are deliberately designed to look ridiculous to take the power away from them, and there have been a good few laughs over the results. How amazing is it that people can laugh about an externalization of a condition that has at times tortured them?! It’s so healing! I believe a few psychiatrists are starting to use the idea in their practices. Olivia’s story was picked up by the OCD-UK Compulsive Reading magazine and was in a recent edition. The absolute best feedback I’ve had have been from parents telling me that the Olivia concept is really starting to help their children who have previously been encouraged to create frightening externalizations. One woman even told me she hears her daughter explaining to her character, in a calm and collected way, about why she (her character) was wrong! I burst into tears when I read that letter! I was so nervous when I first launched Taming Olivia. I worried people might think it belittled the illness or that I was trying to make a joke out of something painful, but I haven’t heard a single criticism. I’m sure not everyone is a fan but they are, at least, kindly keeping it to themselves. I’d say go for it! Don’t rush; take your time to collect your thoughts. I spent about two months carrying a little notebook around with me and every time I had an idea of a potential blog subject or made an observation about OCD, I’d scribble it down in there. This will give you an indication of the direction you want your blog to go in and have the added bonus of giving you loads of material for when you come to start. This is such an exciting time because you can see everything coming together. Of course, if you don’t want to wait — just go for it. You know what works best for you! My other piece of advice would be to ultimately do it for you. Of course, you want to help others too, but remember people will benefit from reading your posts anyway. The last thing you want is for it to become an added responsibility or pressure. Blogging is an amazing way to express your feelings; writing things down forces you to take your time and consider things carefully. I’ve found it very cathartic and great at helping with the recovery process. It also keeps my brain busy and gives me a real sense of achievement. You stay right on top of Taming Olivia, posting regularly. I admit that I get in ruts, where I start to feel anxious and too overwhelmed to actually do anything. Do you ever encounter writer’s block, and if so, how do you push past it? The website only launched a few months ago and it’s still very much in the honeymoon phase. I am lucky as I am based at home, so I can do bits and bobs when my little one is at Nursery. I know these circumstances will probably change before long so I’ve been doing quite a bit of promotion to get it off the ground. I wanted it to have a solid base that I could build on when I had less time to give it. I think it will be good to take my foot off the gas pedal a bit because I know how beneficial time away from a screen, social media, and reading and writing about OCD can be. It’s all about moderation. I do get times where I feel totally overwhelmed and anxious and wonder what on earth I’ve started. I try to be really kind to myself when that happens. I have a few back-up blogs written before I even launched the website and the artwork was pretty much planned, so I’ve been able to use those, which has taken the weight off. I also have blogs planned in my notebook so I’m yet to have the feeling of starting something from scratch. I’m supposed to be writing a blog about visiting your GP/doctor this week, and I’ve been dragging my feet with it. I know it’s not going to be the easiest one to write and I have a few other things going on this week that need my attention, so I think I’ll either write about something a little lighter or leave it until next week or another time. I naturally put a lot of pressure on myself so I have to actively try to remove it and chill out a bit. If it doesn’t get done this week, it doesn’t matter. And how do you push through everyday slumps and bumps OCD can cause? It all depends on the nature of the slump really. Sometimes I go back to my CBT strategies: identifying and challenging negative and OCD-related thoughts; I might read my positivity journal, or try to concentrate on what I’m grateful for. I might also do some exposure work. Imagining Oliva gets me through many difficult moments because she often helps me nip things in the bud before they have a chance to grow into something more uncomfortable. I find being productive and keeping busy helpful too, along with concentrating on things I enjoy. I’ve collected a dizzying amount of strategies over the years and I’ve written them all down on paper so when I’m not feeling great, and my OCD is kicking up, I can refer to it to find helpful suggestions. I write these lists to myself when I’m feeling on top of my condition and they help me for when I’m not handling it so well. If you could share just one piece of advice with others with OCD, what would it be? My goodness, there are so many things I want to write about here! For me it would have to be to show yourself absolute love, understanding and compassion. Having OCD can really affect your self-esteem and sense of well-being and it is essential that you go easy on yourself. The nature of your obsessions, or even just the fact you have OCD, can make you feel truly awful so be really kind to yourself. Whether it’s just saying “Okay, that exposure didn’t go all that well, I’ll try again tomorrow” or turning down an invitation to something and deciding to rest instead, just go for it. Write a letter to yourself about how strong you are and what you have achieved so far, and when you feel low read it. If you feel bad about yourself get thought challenging, start a positivity journal that lists some of the things you’ve done during the day and all the awesome things that says about you. Treat yourself, living with OCD can be tough, treat yourself to things you enjoy, or to walks, or some exercise. Engage in self-care, do eat well, do get enough sleep. We don’t have to turn into little models of perfection, but there’s a lot we can do to help us fall in love with ourselves and stay in love with ourselves. Those living with OCD are amongst my absolute favorite people: strong, determined, kind, and compassionate. Make sure you know that about yourself too. You are everything! 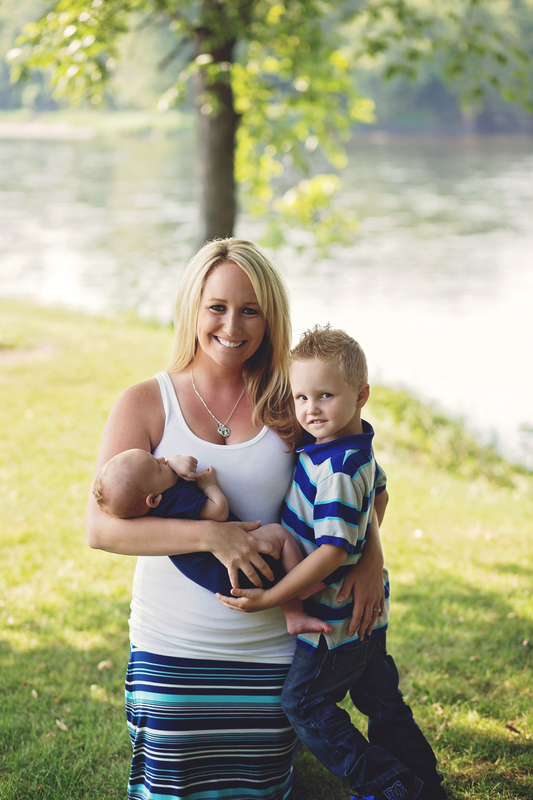 Chelsea with her two oldest children, Brayden and Easton. Help me welcome today’s guest, Chelsea Elker! Chelsea’s a fellow Minnesotan, which I just learned a month or so ago — I’d shared this achingly beautiful post she’d written for The Mighty without realizing we both live in the Twin Cities area, and then she found me after I wrote a little somethin’ for The Mighty and mentioned Minneapolis. Lucky for those of us in the Twin Cities, we have a budding advocate right here — and lucky for all of you, you can check out her blog about postpartum OCD and get in touch with her via email. You’ve been open with your struggles with postpartum OCD. When did you first notice the symptoms, and how long did it take for you to realize it was OCD? I now know that the feeling of the “urge” was my body having a physical reaction against the thought. I now recognize that my anxiety was very high prior to that thought and my overwhelming need to protect Easton caused my body to have a physical reaction against any perceived harm against him. I didn’t know that then, so I spent the next month obsessing about why I would ever think such a thing. Not only was I worried about that thought, but I started having other harm thoughts (all centered on my newborn). I couldn’t forgive myself for the thoughts, I couldn’t let go of the feeling of the urge, and I couldn’t trust myself around him because I felt like I was a threat to him. Before I reached out to anyone for help, I began researching “scary thought baby” or “weird thought newborn” online to see if anyone else had ever had a weird experience like me. I did end up finding some information about what I was going through and by the time I emailed the therapist that I ended up seeing, I was pretty sure of my diagnosis. I wish I could say that figuring out my diagnosis made it easier to overcome, but even with the knowledge of what I was dealing with, I still needed therapy and medication to overcome it. Once you made the connection between what you were going through and OCD, how did you go about treating it? Did a therapist or other doctor make a diagnosis and recommend a treatment plan? I actually found my therapist by Googling “OCD Specialist MN.” By doing that I found a therapist in my area who not only specialized in postpartum women/OCD, but she had also experienced it herself. I felt like if anyone could understand me it would be her. I began going to her and didn’t take any medication at first (I felt very against medications for some reason) and tried to get through it with therapy alone. There were a couple of times where I tried to reach out to my OB and pediatrician, but each time I got scared off because when I would mention having anxiety they would say “well, not about the baby, right?” I would say no and leave feeling worse. Eventually I was fortunate enough to enter The Mother Baby Program which was an outpatient program for new mothers in Minnesota (1 of only 4 in the country), there I was able to take part in group and individual therapy and also get stabilized on medications thanks to their psychiatrists on staff. The outpatient program was a huge turning point for me. When I began my journey through OCD, I felt very alone. I slowly reached out to certain people, but only when I would get to the point where I felt like I would die if I didn’t. I felt such a stigma around getting on medication or joining an outpatient program that it hindered me from reaching out sooner. Can you share some of your obsessions and compulsions with us? My obsessions all revolved around hurting my children, on purpose. Yes, I said it. I thought I was going to hurt my kids and I was scared to death. I thought I would smother my baby, so I never had any blankets or towels near us when I was with him. I thought I would snap his neck, so I was petrified of holding him. I thought I would molest my older son so I never let him sleep in my bed. I thought I might touch my kids inappropriately while changing their diapers or while strapping them into car seats, so I always did those things very quickly, almost paralyzed with fear. This line of thought was endless, obsessive. What advice can you share with new mothers who are experiencing similar intrusive thoughts? If something feels wrong or off, please get help. I’m not saying that from a place of fear for your child’s safety, I’m saying it from a place of love and compassion for your mental well-being. If you are having thoughts that scare you or feel weird to you that means you know the difference between right and wrong. Thoughts caused by anxiety are not dangerous, they may feel dangerous, but they come from a place of fear and a mother experiencing them will go to great lengths to keep her children safe. My biggest fear was that I was losing my mind, I felt crazy. 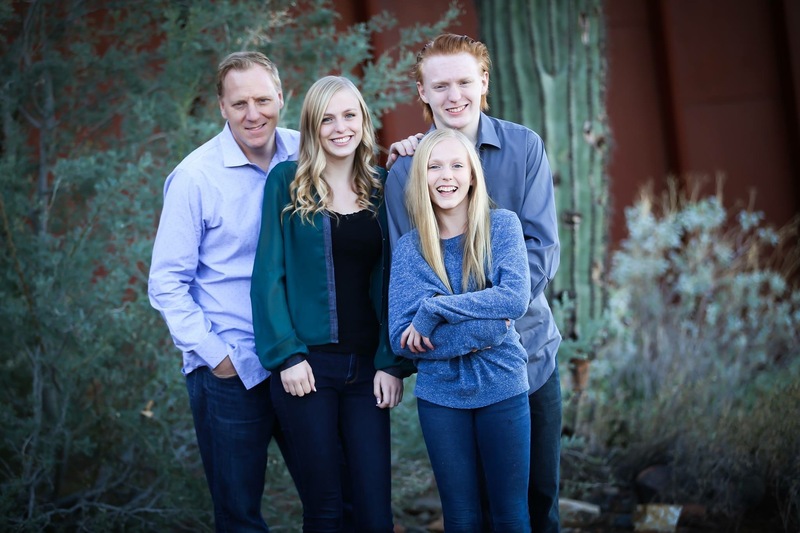 I was convinced that the fact that I was having these thoughts meant that I was dangerous and meant that I wanted to hurt my kids, and that was the furthest thing from the truth. What I learned in therapy is that anxiety/OCD take what you care about most and put them in the worst case scenario. 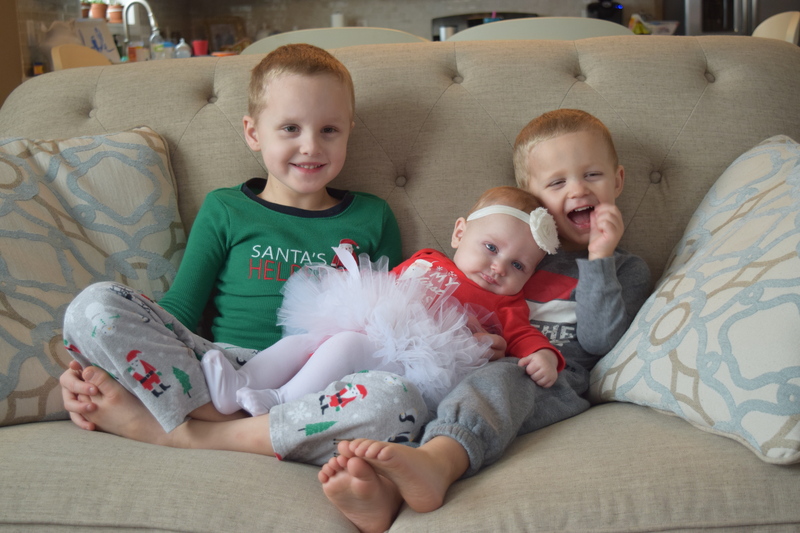 So the face that I was obsessing about my children made complete sense, they are my entire world. It was my job to keep them safe, so the minute that I felt their safety was in danger, at the hands of me no less, I began to drive myself crazy. I needed therapy to get better. I needed medication to calm down. I needed both of these things, but I never once had anyone question my sanity or threaten to take my kids away. Reaching out for help and taking that first step was terrifying, but I had to do it to get better. I deserved to get better and be happy again. I don’t have children myself, but this piece you wrote about your own postpartum OCD spoke to me. Every single line was spot-on and perfectly captured the terror a person with harm OCD can feel. How did you get to the point where you felt comfortable sharing your personal experience? As soon as I realized what was happening to me, I promised myself I would one day help others. It took me almost a year and a half to fully recover, but I did it and I’m making good on my promise to myself to spread awareness. While I was still struggling, I began a blog called Delicate Change, I wrote on and off for about six months, then I kind of didn’t touch it for two years. During those two years I completely healed and had another baby. Though I wasn’t actively updating my blog, people were still finding me online and messaging me either asking for advice or wondering what had happened to me. When my daughter was about six months old, I felt like I should pick my blog back up again, so I did. I’m still working on perfecting it and updating it as much as I’d like, but it’s important for me to show how my life has gone on since experiencing postpartum OCD. In that essay, you say, “You obsess over having ‘the thoughts.’ You obsess over not having ‘the thoughts.’ You cry when the thoughts upset you. You cry more when they don’t.” In those four lines you nailed the dreaded OCD loop, the damned if you do, damned if you don’t anxiety we so often feel. How did you learn to cope with the fear that if you weren’t bothered by the thoughts you must somehow like them and want them? Forcing myself to stop disagreeing with the thoughts felt like jumping off a cliff without a harness. It felt dangerous. I literally felt like I was part of a life or death test, unsure of how it would end up. At the end of the day though, I had to do it. You cannot outthink or reason with OCD. I had to release myself from its grasp. The only way to save myself and my sanity was to “risk” letting the thoughts go. At first it was very hard. It was a very long process. I was annoyed that even though I knew that I had OCD, it didn’t make my journey easier. Being diagnosed didn’t magically make it go away. Knowing others went through the same thing was slightly comforting, but I had to work through the illness day by day on my own. It was the single most excruciating thing I have ever done, I wouldn’t wish those months of anguish on my worst enemy. Today though, I’m here to say that recovery is possible. At my worst I was depressed and felt like OCD would somehow kill me, I now have all of the joy back in my life and am able to be “present” with my children in a way that I wasn’t before. You stay home with three darling little kids. How are you doing now? Life is amazing. I promise that of all the people in all of the world, I was the last person who would have believed complete recovery was possible…but it is. I still think weird stuff sometimes, but I’m able to let it go. The obsessiveness over weird thoughts is gone. I had another baby and I’m smitten with her. I’m so in love. Seeing her and her brothers interact is magical and I’m forever grateful that I’m their mommy. Obviously, every day isn’t cupcakes and roses, but I’m able to handle my anxiety and stress without having intrusive thoughts. I would also like to add that a huge turning point in my recovery came when I noticed myself being able to complain about my children again. I know this sounds weird, but for a solid year and a half, I would never have said parenting was hard or my kids were driving me nuts. Wouldn’t have said it. That is because, at that time, if I said it was hard, I felt like that meant I didn’t want them or that I wished they weren’t here. I couldn’t admit that parenting got overwhelming without assuming it meant I wanted to hurt them or be rid of them. I can now. I can tell my kids that they’re driving me nuts. I can tell my husband I need a break from them. I’m able to make peace with the fact that they can annoy the crap out of me and I love them more than life itself. If you could share just one piece of advice with someone with OCD, what would it be? Please remember that intrusive thoughts are not your thoughts. They are thoughts that come from a place of anxiety and fear. Do not look for a deeper meaning in them or punish yourself for thinking them. People with anxiety/OCD have the exact same thoughts as people without it, the difference is that they cannot let those thoughts go. People with OCD are very sensitive to right and wrong, which makes it hard for them to let go of thoughts that they perceive to be “bad” or “dangerous.” Postpartum OCD is (usually) centered around the baby. Mothers feel such an overwhelming need to protect their children that they will drive themselves completely crazy before ever letting an ounce of harm come to their children. If you are having trouble in any way or just feel “off” please reach out and talk to someone. I know women always want to look like they “have it together” but I’m here to say that it is so very important to take great care of yourself, because it is the only way you can take care of the beautiful babies that you care so much about. We’re approaching one of my favorite times of year — the annual International OCD Conference! 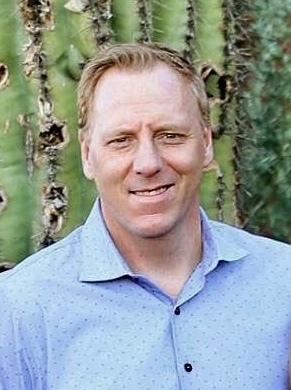 My guest today, former NHL goalie Corey Hirsch, will be there, not only speaking on a panel about his own experiences with OCD but being presented with the Illumination Award. (Remember the year it went to Maria Bamford and how I definitely didn’t make a fool of myself in front of her? Me neither.) Corey exploded onto the OCD advocacy scene earlier this year when The Players’ Tribune published his essay “Dark, Dark, Dark, Dark, Dark, Dark, Dark, Dark.” It’s beautiful! I kept thinking, “Yes! Me too.” That’s what advocacy can do, let others know they’re not alone and there’s hope. Welcome to our sometimes weird little tribe, Corey. The International OCD Foundation just announced that you’re this year’s recipient of the Illumination Award, which you’ll accept next month at the conference in San Francisco. What was your reaction when you found out? I actually started to cry when I found out about the award. To think back to the days where I couldn’t get out of my bed, to getting an award for helping others, it’s so emotionally overwhelming. I’m thankful and blessed to have had a platform to tell my story, as most do not. I am no different than anyone else fighting the stigma. There are many wonderful advocates and people working in the trenches saving lives. Humbled, appreciative, thankful, there aren’t enough words in the dictionary to describe it. 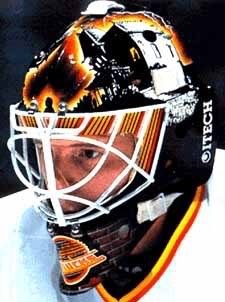 When I type “Corey Hirsch” into Google, one of the first autofills is “Psycho mask.” Tell us why you chose that helmet. The Psycho house mask is in the Hockey Hall of Fame in Toronto now. Initially the painter and I collaborated on the Vancouver Canucks colors of the team. They were black, gold and some red, which reminded me of Halloween colors. So the idea was going to be a Halloween theme. Something scary. I can’t remember who suggested it, he or I, but the psycho house came from the Alfred Hitchcock movie Psycho. It was so fitting for how I was feeling inside my own brain that it couldn’t have been a more perfect suggestion. When I got it out of the box it was almost too perfect. The fire painted in the front was like when you have OCD with the frontal lobe being on fire; eerily, it was almost like the painter knew. The Psycho house was exactly how I felt in my brain, and that I could hide under it when I had it on. “Dark, Dark, Dark, Dark, Dark, Dark, Dark, Dark” opens with a scene of you contemplating suicide. What can you tell someone who feels as alone and confused as you did at that time? First off we need to let society know that talking about suicide does not create suicide. Talk about it and keep talking. Secondly we need to help a person understand that suicide is a permanent solution to a temporary problem and I am proof the problem is temporary. There is help. How it’s so important to reach out if you are feeling that way because when a person is in the middle of it, you can’t see anything else, you can’t see a future, and you need someone else’s eyes and knowledge to help you to find it. In simplest terms it’s like being lost in a forest, and you need a guide to help you out of the forest. Speaking of that piece — God, I loved it. It was heartbreaking, intimate, and so unbelievably relatable. How did you decide you were ready to share your story in a public forum? I always knew I wanted to share my story, and I finally felt safe to do so after having a long talk with Clint Malarchuk. He helped me immensely. I also met another person who had the same OCD as I did. His own mother had to resuscitate him after he overdosed. It was heartbreaking. I am very fortunate to not have substance abuse issues, and I didn’t realize there are others out there who are self-medicating almost killing themselves, feeling hopeless. It was time; I am in a good place in my life and I need to let people know they can get there as well. That hope is real. My obsessions are so personal, I’ve found that telling even one person about them can be difficult. Who was the first person you told, and how did you go about it? I think my mother was the person I told early on looking for answers, but she had no idea what it was either, or how to help. So eventually I went into hiding and survival mode. The obsessions are still personal and hard for me to talk about, I don’t get into the content of mine, but I do let people know the three categories of Pure O and that I’ve had all of them. I want to educate people on Pure O and I don’t want to miss anyone. So as hard as it is, I feel I have to talk about it. OCD is hard for anyone, but I’ve never felt that I have to appear stronger than I am, that I shouldn’t show my emotions, that I shouldn’t cry. It must be different for men, particularly professional athletes. Did you feel pressure to remain silent about what you were going through? Have you gotten any flack for sharing your story now? The locker room is a tough place to have OCD or any mental health issue. Not that guys don’t understand, but there are always 10 guys lined up to take your job. It’s ultra competitive. It’s also why guys hide physical injuries. Societally it’s so much better now, but men have historically been told not to show their emotions. Society over time has taught us that if you cry or show emotions you lose your man card. Thankfully we are in a better place. My story has been extremely well received. If you could see the love and outpouring of support I have gotten, you would never be afraid of sharing your personal mental health story. Society knows it’s a real problem; we all know someone that has been touched by a mental health problem. What can friends, family, and society in general do to support individuals with mental illness? Friends, family and society can help by listening, not judging, and helping encourage the person to see a trained professional. Telling someone how great their life is and they shouldn’t feel that way would only put them in a deeper hole. They already feel terrible enough. If they won’t get help, then it’s important for the healthy person to tell someone they trust or call a help line themselves to get some knowledge on how to handle it. That their brain is lying to them. I always thought why would my own brain lie to me? but it does out of fear. That if a person reaches out, gets help and does the therapy, you too can have an amazing successful life. That you will get better, and you are not weak. Some of the strongest, most amazing people I have met are in OCD recovery. I am not going away, and you are never alone. Welcome to Tuesday Q&A! Today I’m hosting the lovely Kimberley Quinlan, who always makes me feel better whenever she shares a post from her site or comments on anything I post about OCD. She’s wise and thoughtful, and I find her Australian accent very calming (but that’s kind of a side note — her content is what matters most!). See for yourself how wonderful she is. Although you treat more than just OCD, I know you through the OCD community. How did you decide to focus mostly on anxiety disorders, body-focused repetitive disorders, and eating disorders? From my untrained perspective, they seem to share some similarities, such as compulsive behavior. While I don’t have OCD, I did have anxiety as a child and adolescent and I had significant anxiety and disordered eating issues in my early adulthood. When I started treating OCD, OCD spectrum disorders and body-focused repetitive behaviors (BFRBs) during my internship, I immediately knew “these are my people.” Being with my clients with OCD brings me so much joy. I get to sit with my clients and we can be perfectly imperfect together. We can cry. We can laugh. We can be vulnerable. We can be strong. What resonates most for me is my clients’ stories about feeling like you “have” to do a compulsive behavior, despite a deep, inner knowing that it was irrational. This experience is so similar to those who have an eating disorder. Both disorders include an obsession that causes significant anxiety and distress, and both include an array of compulsions that are done to prevent the feared obsession from occurring. I love the posts you publish on your site, particularly your soothing podcasts. Where did you get the idea to share audio posts as well as blog posts? I am a native Australian who moved to the USA in 2001, right after September 11. A few years ago, a friend from Australia emailed me stating that she was struggling with severe anxiety and asked if I could help her. I gave her a list of great books on her specific anxiety and some information about mindfulness, but for days after we connected I wished I could be more helpful. There are lots of great mindfulness resources out there, but so few are specific to anxiety disorders, BFRBs and eating disorders. I quickly decided I would do a podcast for those who have these specific disorders and have little access to resources. I went out and bought a decent microphone, set it up in my kitchen and I just started talking. It is kind of funny now that I think about it. I think I did my first episode in my PJs while my newborn son was napping. Your practice is in the Los Angeles area, and of course it’s not the only clinic for individuals with OCD to choose from. What advice do you have for people who don’t live in an urban area or within a comfortable driving distance of a provider? How about for those whose insurance doesn’t cover proper treatment for OCD? There are some wonderful books and online resources (Yahoo forums, e-books, online classes, etc.) out there for those who cannot access face-to-face treatment. The International OCD Foundation (IOCDF) is a great resource for anyone wanting to get down to business and work on their OCD. If you are doing a Google search for resources in your general area, just make sure it focuses on cognitive behavioral therapy (CBT), exposure and response prevention (ERP) and mindfulness. There are some great options for teletherapy (online therapy) with trained therapists from your home computer or electronic device, if that is financially possible for you. Check the IOCDF website for therapists who are trained to help you and offer this option in their practice. There are some laws that prohibit out-of-state teletherapy, so check with the health care provider first. Finding a good CBT therapist who uses ERP and who takes insurance can be very difficult. If you cannot find a therapist trained in CBT and ERP, please do not give up. My best advice is to find an in-network therapist who you feel comfortable with and direct them to the IOCDF for resources to help them to understand how to help you. Also, as mentioned above, there are some great books and workbooks for OCD using CBT and mindfulness. Bring the workbooks to therapy and go through them together. Having the support of a therapist (or even a friend or family member) can be super helpful and can help you to identify issues that you aren’t aware of. What would you tell a client who doesn’t think ERP would work because she doesn’t have compulsions such as repetitive hand washing? Overt compulsions (behaviors you can see) are not the only kind of compulsions. This is a big misconception. Hollywood has done a great job at portraying OCD as a disorder where one might perform a lot of hand washing or crack jumping, but it rarely shows the other compulsions that come with OCD. Compulsions also include reassurance seeking, avoidance compulsions and mental compulsions. You can do ERP with any of these compulsions. If you tend do to a lot of reassurance seeking, you could challenge yourself to not ask for reassurance and sit with the uncertainty that something bad will happen. If you tend to do mental compulsions, you could write an imaginal exposure about your obsession coming true and read it many times per day, while allowing the physical discomfort of anxiety. If you tend to do avoidance compulsions, you can work to gradually touch or be around your feared object or thought. I have learned that there is always a way to do ERP, and ERP is essential to your treatment. You just have to get creative! Oh my stars, no! I cannot tell you how many strange and inappropriate thoughts I have had about my children or my family members’ children. If we are honest with ourselves, I think we all have had them, in some shape or form. The hard part is those with OCD tend to give these thoughts way too much value. My 5-year-old daughter who doesn’t have OCD told me the other day that she had a “scary nightmare about hurting a kid, but it was while we were in the car coming home from school.” She decided to call these thoughts “day-mares” and she thought that was pretty funny. We give those “day-mares” as much value as we give the nightmares we have during our sleep. I love this idea and I talk with my clients about this too. Unfortunately, our society is widely uneducated on OCD and how to respond to it. Stopping the cousin from being around kids will only enforce a faulty belief that her thoughts are valuable and, resultantly, make her OCD worse. In this case, I would tell the cousin to allow the thoughts to be there while she is around the kids. Even better would be to practice having the intrusive thoughts as much as she can. In my office, we play a game called “One-up.” During this game, we take turns coming up with the most scariest thoughts. The goal is to “one-up” each other by making the thought just a little bit more bizarre and frightening than the last one. It’s a great way to practice having scary thoughts without giving too much value to them. I always joke with my clients that my office walls have heard it all. Do you have any advice for a young person who hasn’t yet told his family or friends that he has OCD? Are there good first steps he can take in “coming out” with OCD? I love Brene Brown’s idea of trusting those who have filled up his or her “marble jar.” She talks about how her daughter’s elementary teacher uses a glass jar and puts in a marble if the kids are behaving well. If they aren’t behaving well, the teacher takes a marble out. When the jar is full, the teacher has a party for all the kids. Brene Brown uses this metaphor as a way of determining if we can trust someone. If a friend has shown through many incidences that they can be trusted, their metaphorical jar is full of marbles. Those are the people who I would confide in. If that person has been consistent in showing they can be trusted, and you believe their jar has been full for a while, take a leap of faith and try sharing with them. That being said, I would be prepared for lots of questions. Try not to take their questions as judgment. The person you shared with might not understand entirely. Try to educate them as much as you can, or refer them to some of the great books or websites out there. If you could share just one piece of advice with individuals with OCD, what would it be? In my opinion, overcoming OCD takes two things: Deep desire and hard work. I have seen so many people get better. They come in to my office having spent years struggling and battling OCD. The ones who conquer OCD are the ones who have a deep desire and they go to work. It’s really very inspiring. When I started working on my own anxiety in my early 20s, I didn’t have a therapist. I would read every book I could find and write extensive notes. I would take long walks while listening to helpful podcasts about the issues I was dealing with. There are lots of people out there who can lead you in the right direction. Remember, deep desire and hard work is all it takes. I’ve been volunteering with OCD advocate Jeff Bell’s great organization, A2A Alliance, and earlier this week he interviewed me for their new series, A2A 1-on-1. It was so much fun!